I am really, really scared of sharks! As a child, I was even worried that they were in the swimming pool! Lilli – I have been called that since I was a baby. Being stranded in the open ocean. It’s informative and educational, but is friendly and simple too. Educated, friendly, happy, perfectionist, mother. Dr Dolittle because I always talk to the animals! 1969 – the year the first man walked on the moon. I am fascinated by space and it would have been incredible to witness an historical event like this. Enjoy every minute of being a kid and don’t be in a hurry to grow up. My parents – they are good people with strong moral values that inspire me to be the best person I can. I have always wanted to write a children’s book about pets, but it was after the birth of my son Hudson that I was inspired to actually do it. Perseverance – because this is the only way to achieve your goals and dreams. Did I ever Tell you How Lucky You Are? by Dr Seuss, because the rhymes never get boring and this story reminds us to be grateful for what we have in our lives. Dr Lisa Chimes is an emergency vet at an animal hospital, known for her TV appearances in Bondi Vet. 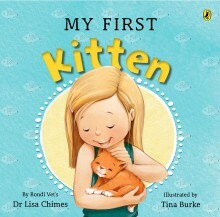 Lisa's passion for animals and their care has led her to write two picture books, My First Kitten and My First Puppy, published by Puffin Books. 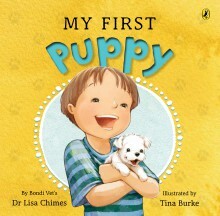 The books combine an entertaining story with information about selecting and caring for a new pet and are available from the end of July 2015.